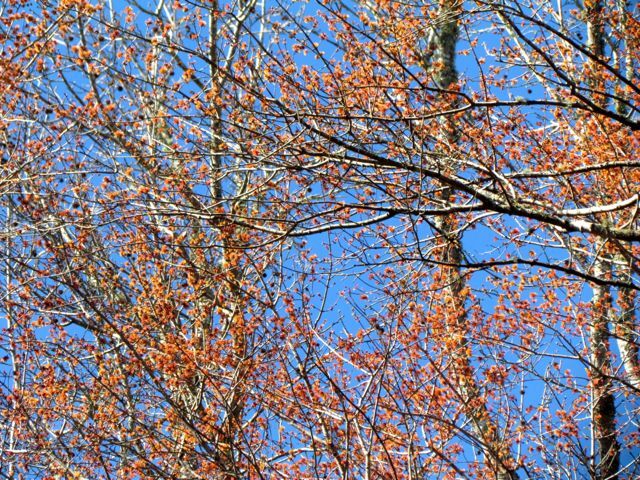 Red Maple flowers brighten the canopy. OK, there’s still a pile of snow in my back yard. Really. It was a huge pile from cleaning our back deck, and it’s still not quite gone. But don’t tell that to the Spring Peepers or the Red-shouldered Hawks nesting on the floodplain, or the Red Maples throughout my yard. They all seem to be persuaded that Spring has arrived. It hasn’t, of course — not quite yet. 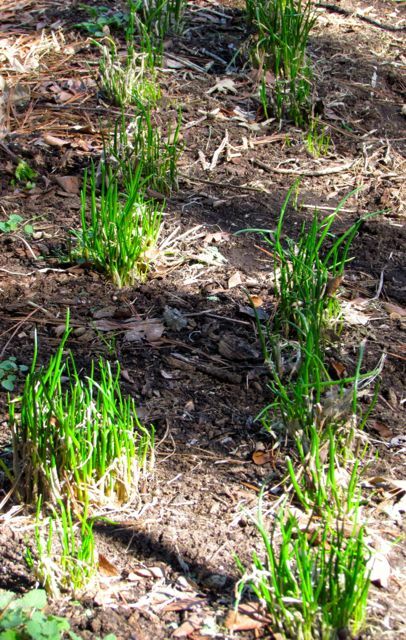 But it seems as if the plants and animals in my yard have been biding their time, waiting for the frigid air to exit so they could explode into Spring Mode. Most of the early-flowering plants had impressed me with their patience, not showing a hint of bud break as the arctic air ruled my region. The flowering apricots were hit pretty hard, of course. 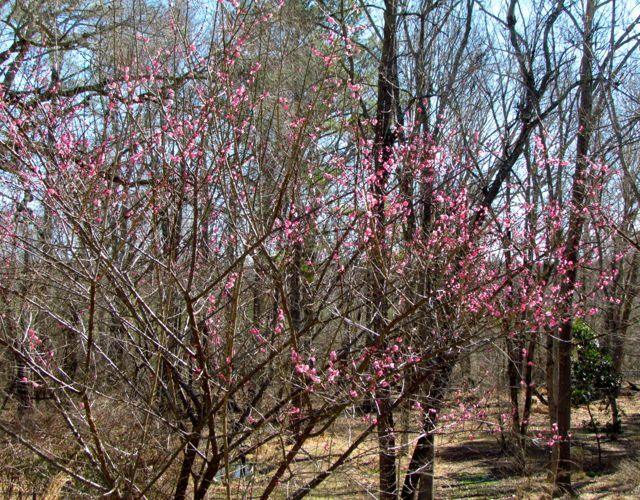 Many just-opening buds were browned by freezing temperatures. But the unopened ones still tightly shut have now opened with enthusiasm. The air around my front yard is fragrant with their perfume. I am delighted, and so are the honeybees finally making their appearance during recent warm afternoons. 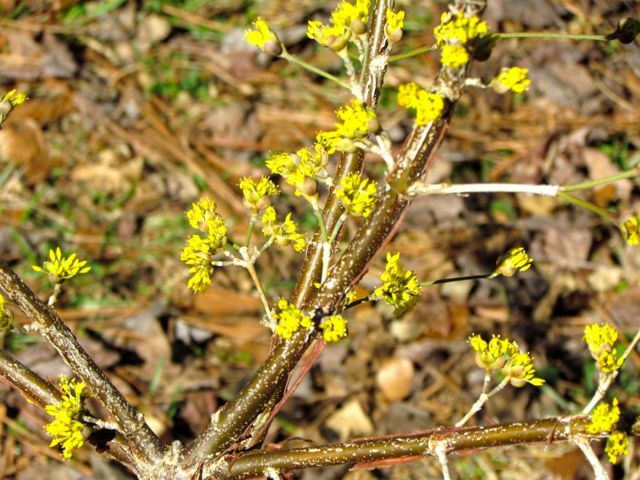 The Cornus mas trees burst into spectacular bloom, yellow spotlights in a mostly brown landscape. 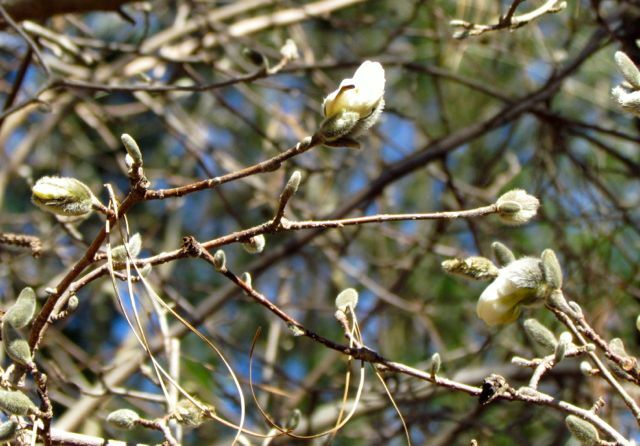 The Magnolia stellata ‘Royal Star’ had been exhibiting unprecedented patience with the weather, but recent 70-degree days have caused its flowers to begin opening. 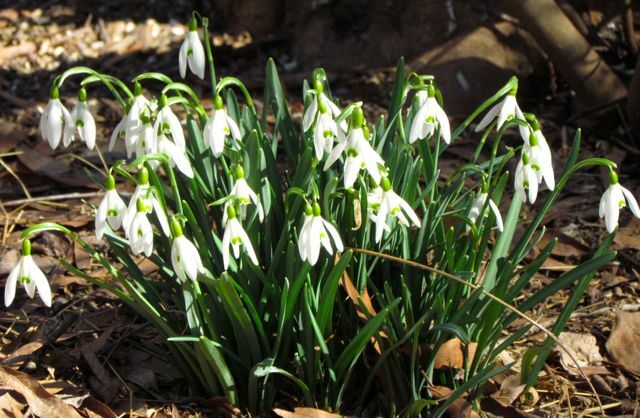 The snow drops survived being buried by six inches of snow and ice and are in full bloom. 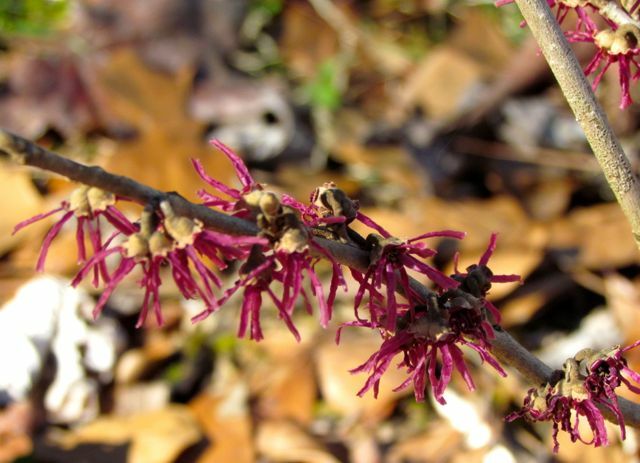 And the Witch Hazel ‘Amethyst’ is scenting the breezes with the fragrance of gorgeous purple flowers. Amethyst lives up to its name. The warmer temperatures have all the early-nesting birds displaying territorial behavior as they pair off and claim nesting sites. 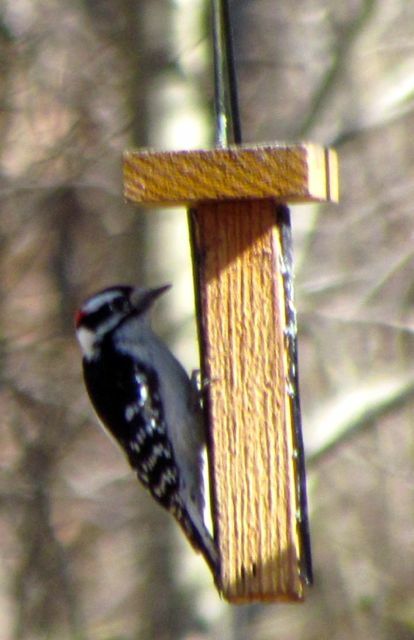 Woodpecker drumming punctuates the air from dawn to dusk. 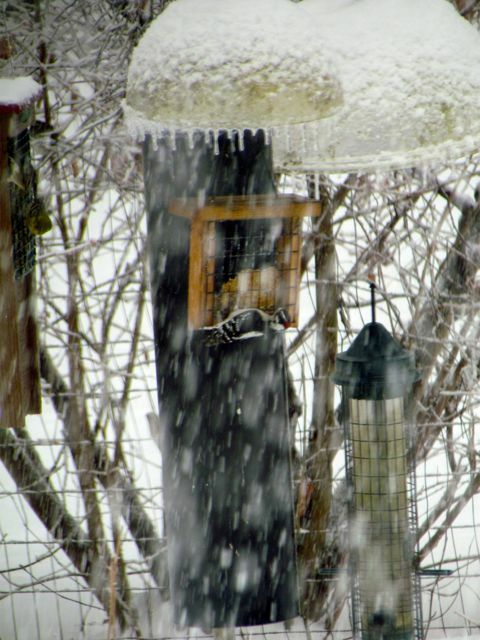 A Downy Woodpecker male refuels between bouts of territorial drumming. 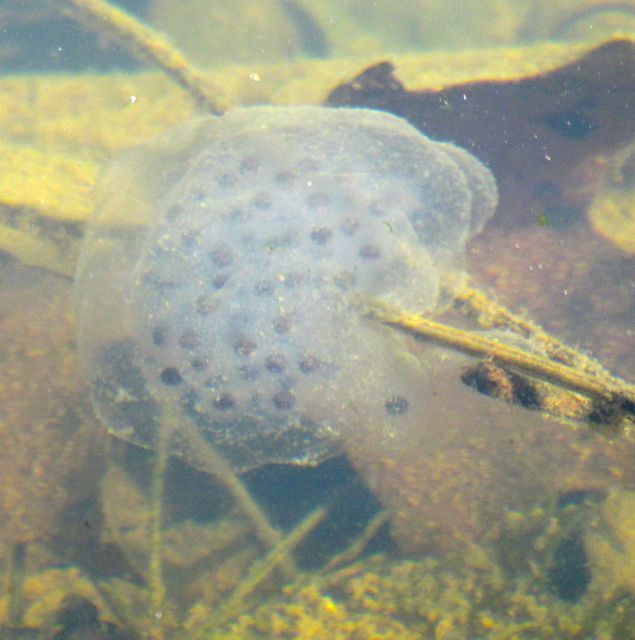 And the salamanders somehow managed to complete their late winter mating activities despite the cold and ice, as evidenced by this glob of eggs in our tiny pond. Those black dots are developing embryonic salamanders. Of course, my gardening fingers got itchy the minute the weather warmed and the frogs began chorusing 24/7. 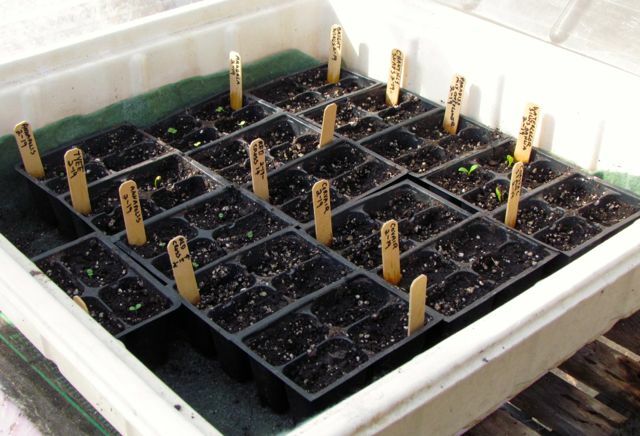 I got out the seeds that I’d ordered and contemplated my strategy. 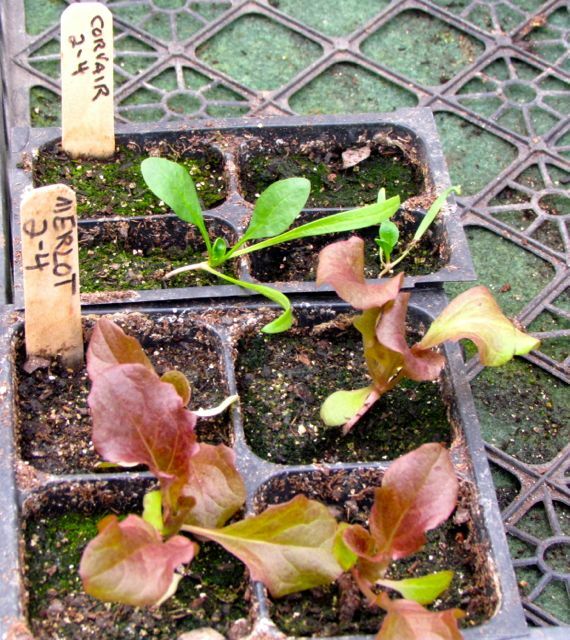 The nonpelleted lettuce seeds are well up. 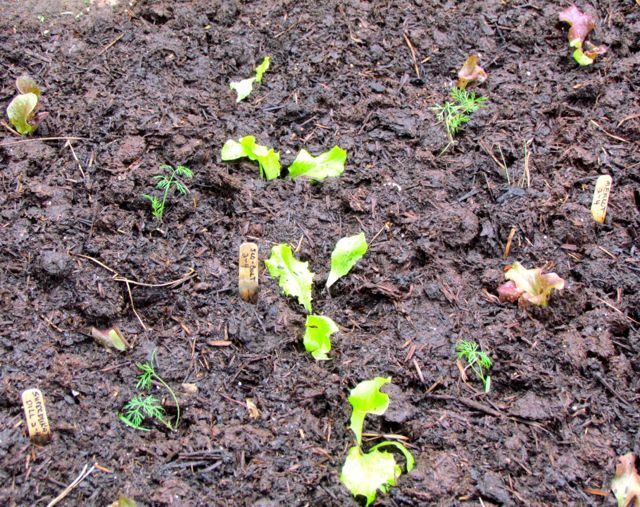 The coated lettuce seeds are still meditating on the merits of germination. One Tyee spinach has emerged; spinach is always slower than lettuce. All the arugulas are up and growing. And the dahlia seeds I sowed have begun to emerge — the first of the flowers, and a bit of an early surprise. 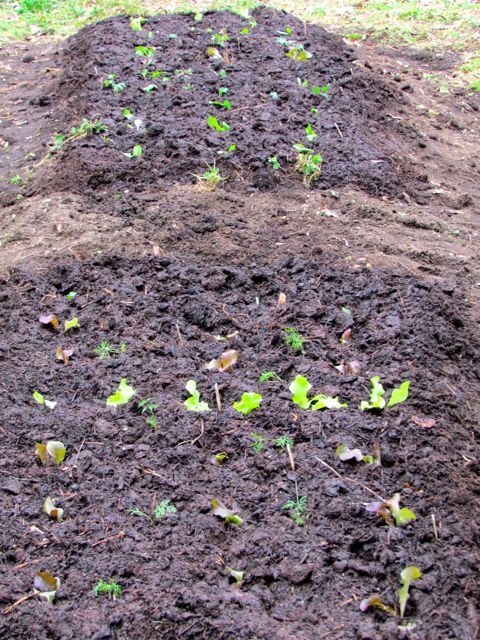 Now that I’ve got seeds going, it was time during our first warm weekend in forever to return to the vegetable garden and begin to prepare the early spring garden beds. I’ve got one weeded and ready to go for the greens. I’ll do more as weather and my aging joints permit. Greeting me with enthusiasm were the chives I grew from seed two years ago. I was a bit worried that our prolonged freezing winter temperatures might have killed them. I worried for naught. These beautiful, delicious herbs are well on their way to growing tall enough to once again season salads, eggs, and whatever else can use a light taste of oniony goodness. 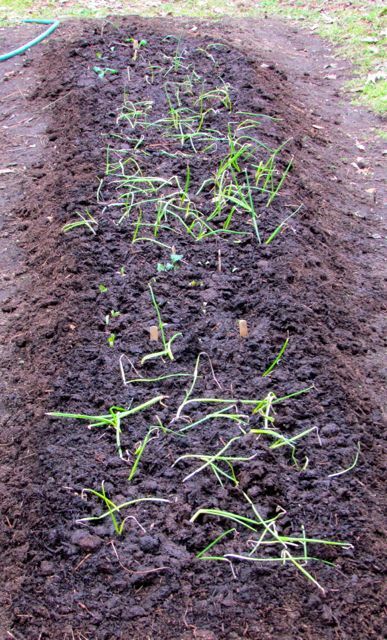 Chives showing they can handle Winter’s worst. This week’s return to winter temperatures will be harder on me than the plants and animals, I imagine. It felt so wonderful to be back in the dirt, pulling weeds, cleaning up old flower stalks, discovering sudden flowers tucked into various parts of the yard. On the other hand, my creaky joints could use a day or two — OK, maybe three or four — to recover from my pent-up gardening enthusiasm. Perhaps I’ll even feel a bit nostalgic toward this latest round of wintry temperatures. Because now I’m sure — Spring really is almost here! It started suddenly and at a faster rate than I’ve ever seen. Within an hour, several inches of the white stuff coated every surface. 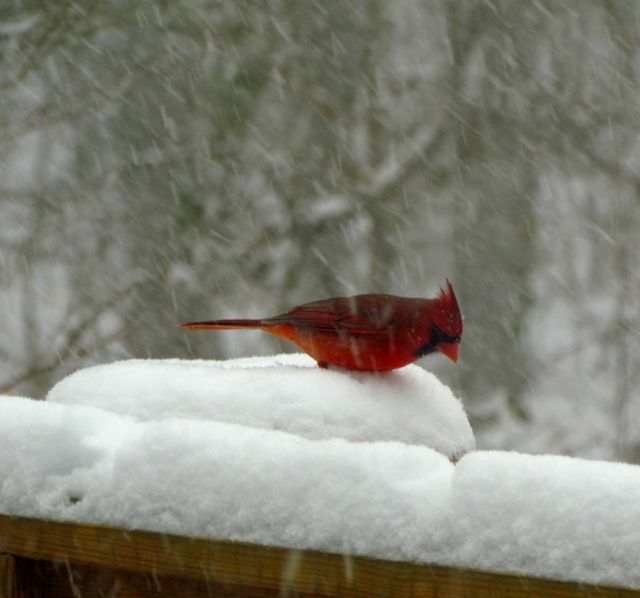 This confused cardinal is sitting on top of the bird bath attached to my deck railing. Poor guy. All the birds seemed as surprised as the humans who got stuck in massive traffic jams in my state. 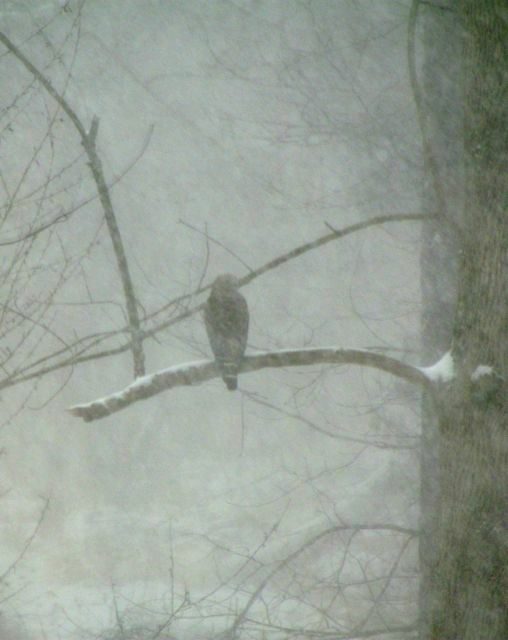 This Red-Shouldered Hawk had been patrolling the floodplain and calling to his mate. For the longest time after the snow started mid-day last Wednesday, he just sat on that branch, as if he didn’t quite know what to do. By late afternoon, the snow changed over to sleet, then freezing rain, as evidenced by the small icicles dangling from the deck rail. This was fingernail-biting time. 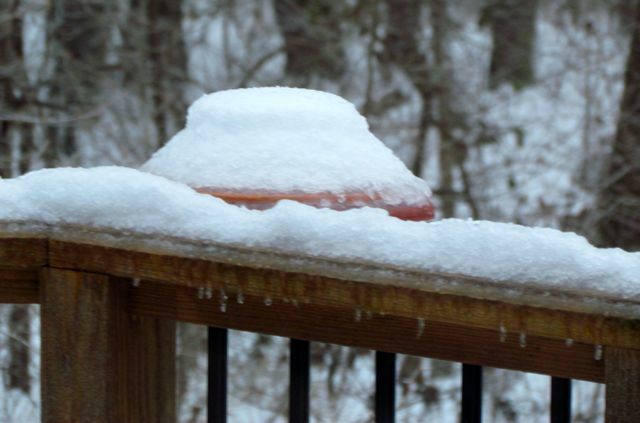 Would the icing stop before enough accumulated to pull down trees and power lines? 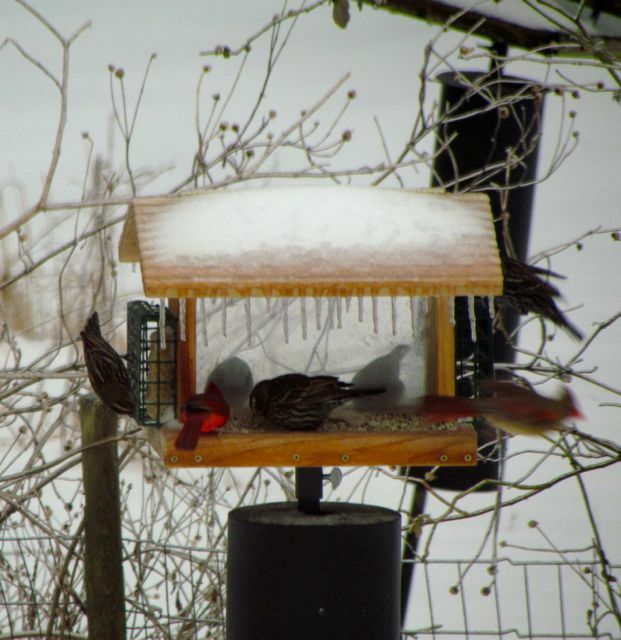 My suet feeders have never been as popular as they were during the ice storm. It was every bird for itself out there. Fortunately for us, the sleet/freezing rain stopped late in the afternoon before power outages were widespread in North Carolina. I gather that parts of Georgia and South Carolina were not as fortunate. My condolences to the powerless. 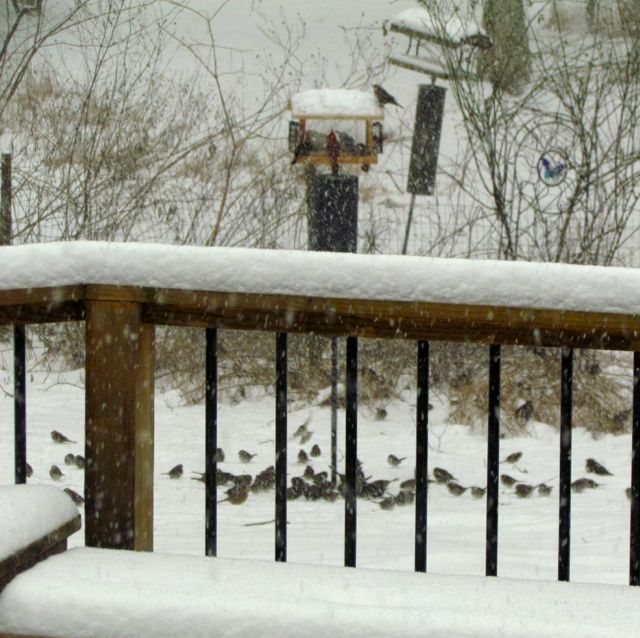 The birds used the lull in the storm action to fuel up, as if they knew this was but Round Two of a three-part storm system. Thursday morning dawned dark and icy. 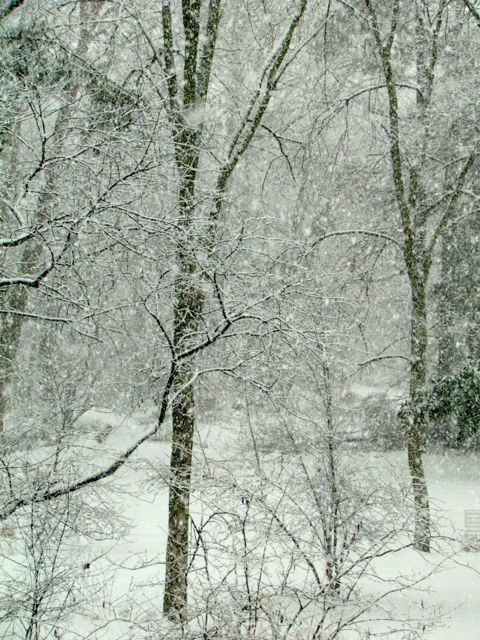 Soon the last round of heavy snow would begin. We got six inches on Wednesday. We were warned that 3-4 more inches would collect on top of ice-covered surfaces. It hit hard and fast again. Snowflakes instantly clung to every icy surface they encountered, making for a spectacular display. 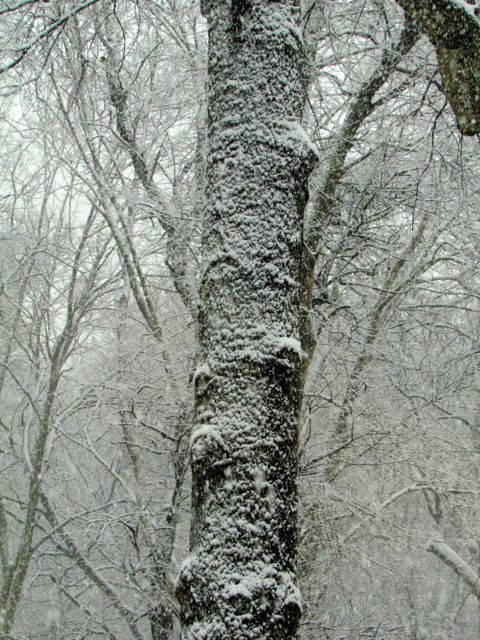 Even ice-covered tree trunks used the snowfall to dress in their wintry best. But the weather seers were wrong, thank goodness. We only got about another inch or so before the snow headed north. Friday morning brought sunshine and the beginning of melting. Branches were bare of ice and snow by later afternoon that day. Despite temperatures in the low 60s during the day, you can still find piles of snow on the shady sides of roads and forming mountains in parking lots. My yard is a study in microenvironmental variability. The cold north-facing side that backs up to tall cedars is still covered in an unbroken blanket of white — thinner than it once was, but still slippery. 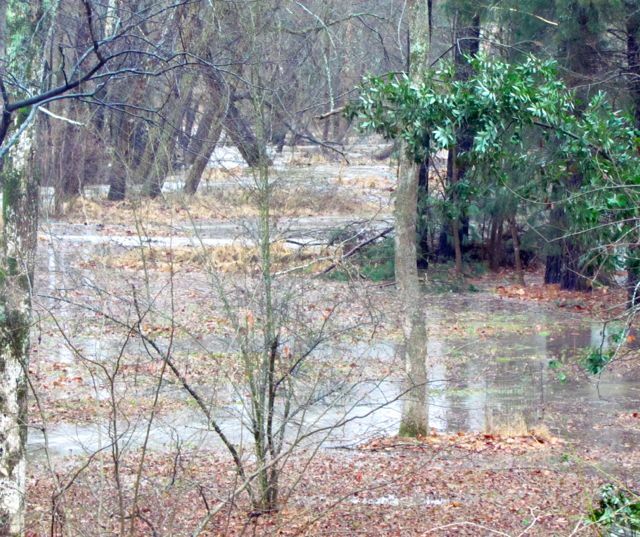 Warm rains and above-freezing nighttime temperatures should rid us of the last remnants soon. And just in time. 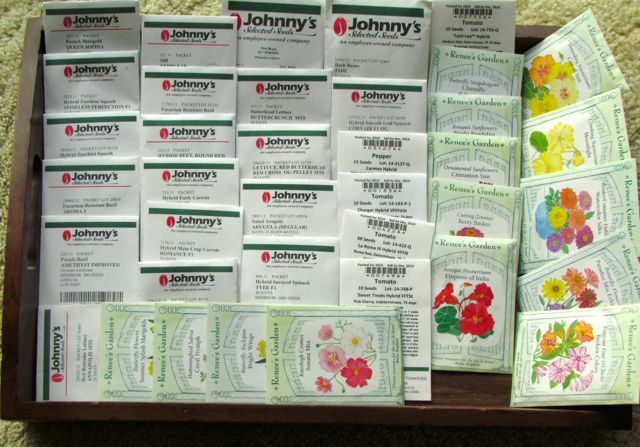 All my vegetable and flower seeds have arrived in the mail. 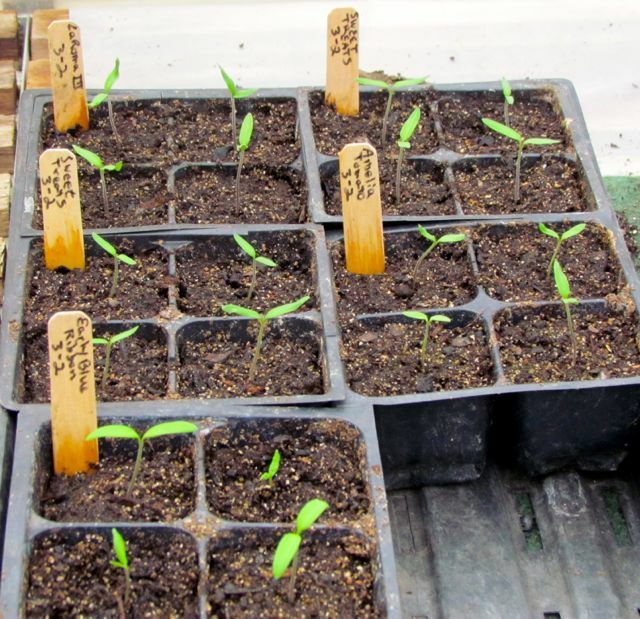 It’s past time to set up the greenhouse for spring sowings of greens and peppers, along with the flowers that take longer to grow to transplanting size. I’m off to plan and prioritize, eager to get seeds in potting soil. But I must wait to prepare the beds in the vegetable area. 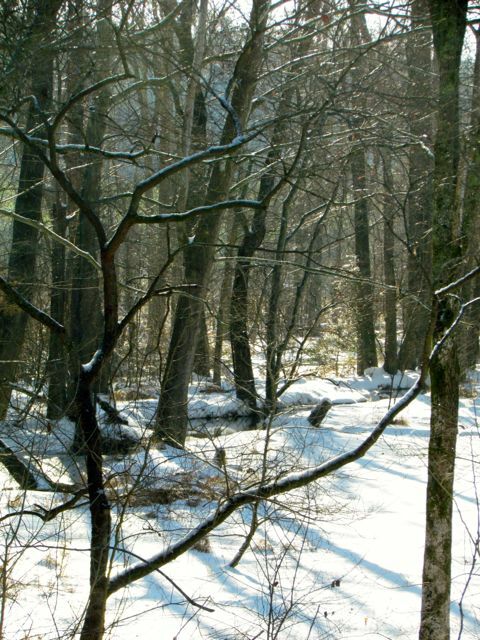 They are still covered by lingering snow. I’ll share what varieties I’m trying this year in another post soon.